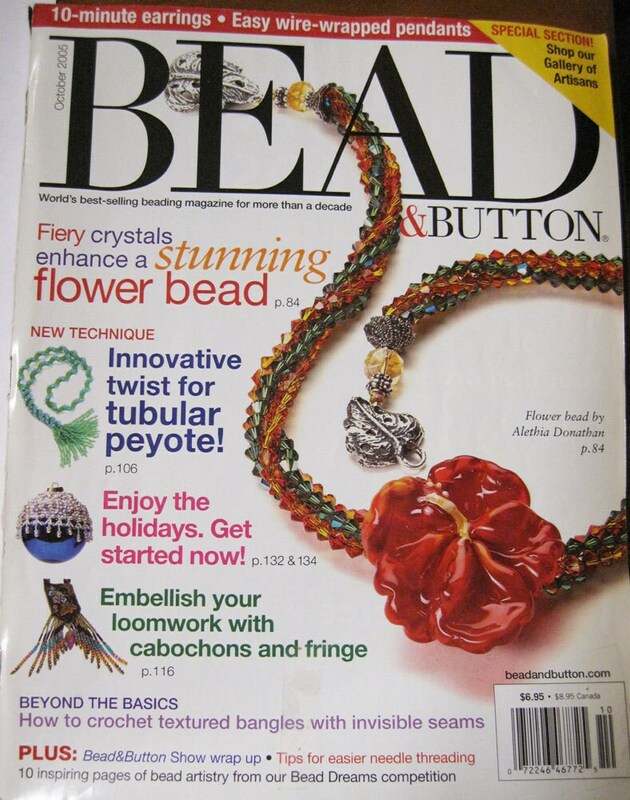 In this October 2005 issue of Bead and Button Magazine, projects include: 10 minute earrings, easy wire-wrapped pendants, Fiery crystals enhance a stunning flower bead, innovative twist for tubular peyote, enjoy the holidays making ornaments, embellish your loom work with cabochons and fringe, how to crochet textured bangles with invisible seams! Plus tips for easier needle threading, 10 pages of bead artistry from Bead Dreams competition! Card Party gives instruction on embellishing cards with ribbons and bead embroidery! Add seed beads and M & M sized lamp work beads to create a bracelet of playful loops using peyote stitch and picot edging! Jump start your imagination with Aleta Ford Baker's new twist on peyote stitch - FYI, her book Universal Beadweaving is out of print - so this is a collectable magazine!! Plus bead crochet infinity bangles, herringbone rope, wire wrapping dichroic glass cabochons, peyote stitched ornaments and more!